Malaysia’s former Prime Minister Najib Razak has been hit with 25 new corruption charges linked to the 1MDB scandal. Najib was detained by Malaysia’s anti-corruption agency on Wednesday, for allegedly transferring $681m into his personal bank account, as part of investigations into the 1MDB state investment fund. 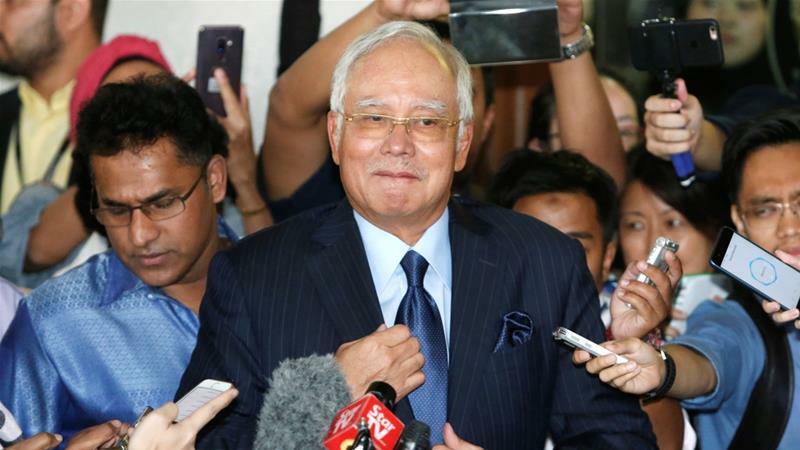 “These new charges are significant because prosecutors allege the money flowed directly from 1MDB, the state investment fund that Najib had set up,” said Al Jazeera’s Florence Looi, reporting from Kuala Lumpur. The 1MDB scandal first became public in 2015 when leaked documents showed that $681m was transferred into Najib’s bank account, leading to massive street rallies calling on him to resign. The scandal was a key factor in Najib’s shock defeat in the May elections. The new government – a coalition of opposition parties headed by Prime Minister Mahathir Mohamad – reopened investigations into corruption at 1MBD that were stifled while Najib was in office and set up a special task force. Malaysian police have also issued an arrest warrant for businessman Low Taek Jho, often called Jho Low, in connection with the 1MDB investigation, Al Jazeera’s Looi reported. “He is alleged to be a key figure and the mastermind of this complex scheme to defraud the Malaysian government,” she said.